This heart box is the perfect size to hold M&M’s, mints, nuts, or even the miniature candy bars. The box measures 3” x 3” x 1”. I’ve left the hearts blank so they can be decorated in a wide variety of ways. I used watercolor pencils to color them, but markers or craft paint would give deeper colors. And of course I needed to add an outline of iridescent glitter to finish the project. 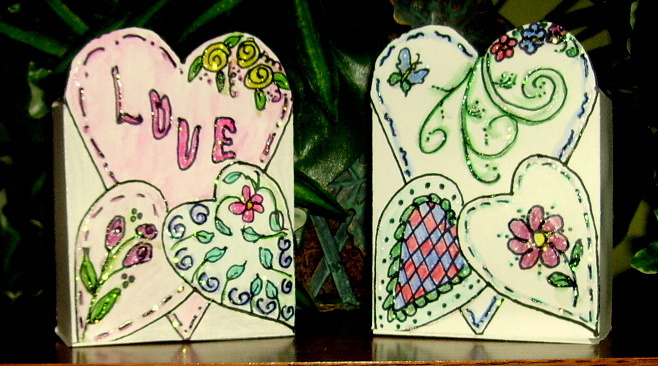 This heart box could also be used for a Mother’s Day gift box. The “Heart Box” can be found in the Valentine’s Day Projects Gallery in the sidebar. This entry was posted in Valentine's Day and tagged childrens valentine projects, easy valentine crafts, heart box, kids valentines to make, valentine crafts, valentine crafts for kids, valentine heart box, valentine treat boxes to make, valentine's day. Bookmark the permalink.